Acer revealed several new devices this week that are set to come out over the next few months — new tablets, laptops, a convertible, an all-in-one, plus a tease for new smartphones and a smartwatch that we Americans probably won't get to buy. The rest of the lineup is solid and includes a little something for those of you who miss the netbook. 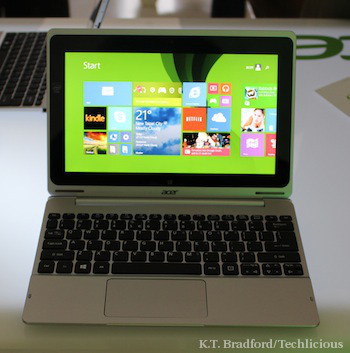 The belle of Acer's ball is the Aspire Switch 10, a Windows 8.1 hybrid laptop/tablet running on an Intel Atom processor. The CPUs in this latest generation aren't as slow or sluggish as they were in the past. You can actually get a good balance of mid-range power and long battery life, and that's what we hope for with the Switch 10. The 10-inch IPS display has wide viewing angles and a responsive touchscreen. The screen is glossy and does kick back some reflections, but not to a distracting degree. In the short time I played with it, I found the system to be snappy overall and the colors on the display bright and popping. I'm a fan of the hinge and docking mechanism since it doesn't require pressing or sliding a button to unlock — just a firm tug. The magnets guide the tablet into its proper place most of the time, and it's easy overall to separate and join the two halves. The magnets are strong enough that you can even carry the whole thing by the display without fear of the keyboard falling off. This hinge will accommodate the tablet in both directions, so you can dock it backwards and access the screen in viewing mode or tent mode (just like the Lenovo Yoga) or use the Switch 10 in tablet mode with the keyboard still attached. The keyboard dock has a comfortable keyboard and a good-size touchpad. The keys have a matte coating that will take some getting used to, and the dock doesn't feel as premium overall as the tablet part, which has an aluminum backing. The single USB port appears to be 2.0 instead of 3.0, making it less useful; in this circumstance, two would have been better. The tablet section only has a micro-USB port. The dock does not come with a built-in extra battery, though there will be a version that adds a hard drive to enhance the tablet's internal storage (32GB or 64GB). The lack of battery is probably designed to keep the weight down. The Switch 10 with dock weighs almost 2.6 pounds, which feels a little heavy for a laptop this size but is still an acceptable weight. The Switch 10 will come out later this summer and cost around $380. This is a little more expensive than the 10-inch ASUS Transformer Book T100, which utilizes a similar CPU but comes with 64GB of internal storage, USB 3.0 in the dock, 11 hours of battery life and Microsoft Office 2013 included for around $350. Though the Transformer Book came out last year, it still looks like a better buy based on specs. It will be interesting to see how it compares with the Switch 10 when we get a chance to test it. The other tablets Acer announced, the Iconia One 7 and the Iconia Tab 7, run Android rather than Windows. 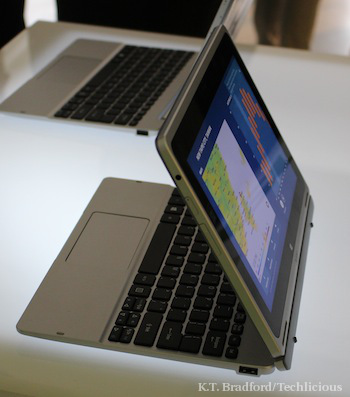 The One 7 is the budget tablet of the pair, starting at $130. It has a dual-core Intel processor, 8GB or 16GB of internal storage, a microSD card slot and a 1280 x 800 display. Though not the finest display I've ever seen, it's got acceptable viewing angles, and the design is fun due to the bright colors and textured feel to the back. The Iconia Tab 7 feels a bit more premium, sporting not only a better display (same resolution) with anti-fingerprint coating and a silver back, but also a SIM card slot for integrated 3G connectivity. The Tab 7 will even be able to make phone calls. We've seen this before in 7-inch tablets, although the majority of them have launched overseas only. Acer didn't give a launch date for the United States or even a price in dollars; it's €149 in Europe, so likely less than $200 if it comes here. But perhaps we'll get a SIM-card-free version later this summer or fall. Neither tablet will turn heads away from the Nexus 7, which was launched last year and likely to be refreshed in a few weeks, or any of the 7- or 8-inch tablets from Asus or Samsung on the market now. The low price of the One 7 makes it attractive to parents of tweens and teens, and the choice of colors will make it attractive to the kids themselves. The new Aspire E Series laptops, on the other hand, are all about choice. You can choose between Intel or AMD processors, touch or no touch, glossy or matte display, HD or full HD resolution and several color choices. They come in 15-, 14- and 11-inch sizes. Of the three, the 11.6-inch version — the Aspire E 11 and V 11 (touch) — is the least impressive even to someone who appreciates smaller laptops. The glossy display version is far too glossy, throwing back reflections and easily distorted by light. The matte/anti-glare version does far better in light, but colors aren't as rich and vibrant as on the glossy version. And the matte coating on the keys makes typing unpleasant. It's too bad, because the overall design is attractive, the weight is good for the size, and there are plenty of ports. The larger E 14 and E 15 models keep it light for their size and also come in a variety of colors and patterns. Aluminum lids add a premium touch, and though the issue with the glossy displays plagues these laptops too, glare isn't as bad as on the smaller version. The keys are more comfortable to type on as well, and all of the ports are on the left and right sides, making them easy to access. The touchpads are very large and well positioned. There's enough surface area so that even if you choose a non-touch version, you'll be able to pull off gestures and navigate Windows 8.1 easily. In my short time with these laptops, the touchpads appeared to work smoothly with no annoying hitches or unresponsiveness. These laptops aren't designed to be top of the line models but rather good mid-range offerings at a low price. The E 14 and E 15 both start at $300, and there are so many configuration options (such as hard drives up to 1TB) that you'll be able to find a good balance between price and power even if you go beyond the least expensive option. The E 11 starts at $270, and the touchscreen V 11 starts at $370 — both decent prices for a small laptop. All models will be out toward the end of June or early July. 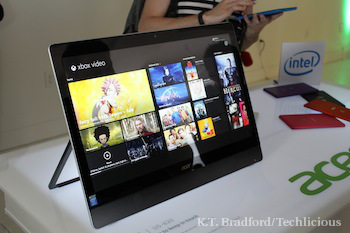 The 23-inch, Windows 8.1 Acer Aspire U5 all-in-one computer comes with a full HD IPS display, making it a good choice for watching media as well as other tasks. It should make for a great family computer for several reasons, starting with the full HD webcam in front. It's Skype-certified with a wide-angle camera, so when you video chat with distant relatives, they'll be able to see more people on screen. An integrated hinge gives you a wide range of angles, including lying flat. It's simple to turn this device from a computer to a gaming surface. The Aspire U5 will also be out in late June, starting at $1,000. Acer has also dropped teasers for a couple of new smartphones they call Liquid Jade, as well as a wearable fitness tracker/smartwatch called the Liquid Leap. It's doubtful that either will come to the United States, although Acer reps said they are in talks with carriers. Overall, Acer's summer lineup is all about decent devices for a good price, not so much about flashy devices. This is a good thing, as there's a need for affordable, dependable laptops and tablets. I'm looking forward to testing these when they arrive later this summer. 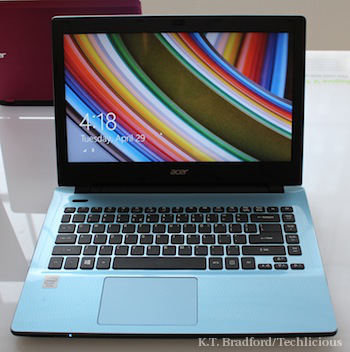 If they're as good in practice as they are on paper, Acer may end up on many a back-to-school shopping list.